After weeks of rumours, it has been confirmed that The Police will reunite and play at the 2007 Grammy Awards. The band, led by Sting, were one of the biggest groups of the early 1980s, with success on both sides of the Atlantic. Songs like Every Little Thing She Does Is Magic and Message In A Bottle fused the energy of punk with the rhythms of ska and reggae, and dominated the pop charts. And the band became one of the first to utilise MTV with their moody, Godley and Creme-directed videos. 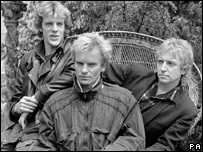 Sting first played with drummer Stewart Copeland and guitarist Andy Summers, in a band called Strontium 90 in 1977. After changing their name to The Police, the band slimmed down to a trio and recorded their debut album - Outlandos D'Amour. Among their first tracks was a Sting-penned paean to a prostitute, Roxanne, which landed the band a recording contract with A&M records. A string of top 20 hits soon followed in the UK, including such classics as Message In A Bottle and Walking On The Moon. The band wasted no time in taking their unique sound to the US where they embarked on a gruelling tour, driving themselves and all their equipment around the country in a transit van. The constant stream of gigs, plus their unforgettable bleached-blonde hair (gained while recording an advert for chewing gum) helped The Police establish themselves as one of the foremost rock acts in the US. A similar strategy was used to build up interest in other countries - and the band crossed the borders of Argentina, Egypt, India and Australia in the early years of their fame. By 1980, The Police were budding superstars and fans eagerly awaited the release of their third album, Zenyatta Mondatta. The album, recorded under pressure from the record company, was only finished in the early hours of 9 August - with the band due to start a world tour in Belgium that evening. Although Sting expressed some disappointment with the record, it spawned several top ten singles, including UK number one Don't Stand So Close To Me. The song, which describes a schoolgirl's crush on her teacher, later won a Grammy award for best rock vocal performance. A fourth album, Ghost In The Machine, was recorded on the Caribbean island of Montserrat in 1981. 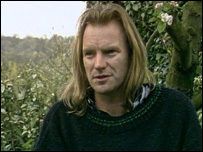 Recording sessions saw Sting asserting more control over the group, taking on lead writing duties and adding more layers to the band's stripped-back sound. But it is the band's final studio album, 1983's Synchronicity, that is considered by many to be their best. Again recorded in Montserrat, it featured the worldwide number one Every Breath You Take, a stalker's anthem propelled by Andy Summers' claustrophobic guitar riff. The album sold more than 10 million copies and won three Grammy awards, but the band had reached the end of its creative life. No official split was announced but the band all pursued solo careers when they finished touring in 1984, amid reports of backstage tensions. In the intervening years their appeal has endured and, in 2004, Rolling Stone magazine placed them 70th in a list of the 100 greatest acts of all time. 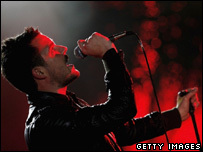 Writing in the magazine, The Killers frontman Brandon Flowers praised the band's technique and longevity. "Everything they did was really smart and worked on a few levels," he said. "Sting already had a career and a degree when the Police made it; he wasn't afraid of sounding grown up." News that the band has reformed after more than 20 years will shock many fans - particularly because of Sting's widely-reported reluctance to reunite with Summers and Copeland. When the band last played together, at their induction into the Rock and Roll Hall of Fame in 2003, he complained the reunion had come "too early". "We were inducted with the Righteous Brothers," he said. "They opened the show and did You've Lost That Loving Feeling and it was like 'Wow, yeah'. "Then we were the last on and I just wished it were happening in 10 years time when I could feel really rosy about it." Perhaps his feelings have changed, or maybe the allure of the Grammys is too strong, but the band have now declared they will open the show in Los Angeles on 11 February. And with several unnamed sources insisting the band will hit the stadium circuit in the summer, it seems the Police could be walking on the moon once again.